Once you receive an order, you might want to ship the orders. StoreHippo offers a seamlessly integrated shipping solution, ShipKaro, so you could ship your orders in just a few clicks. Go to Orders section in StoreHippo Admin Panel. Search for particular order id. Click on order in the search results to see order details. 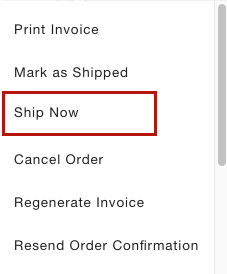 Click on ellipsis button in the top right corner of the order detail panel and click on Ship Now. This will take you to the Ship Now section to confirm the shipping details of the order and to select the logistics provider for shipping. Once you have shipped the order, you can go to Shipments to manage your shipments. You can also cancel the shipment before it is picked up. If you have your own logistic account or want to ship orders outside India we have integrated apps for Fedex, Fedex international, Ecomexpress, Bombino international, Bluedart, DTDC, Xpressbees that can be installed using your own account credentials from these providers. If you have shipped the order through some shipping provider that is not integrated with the platform or have shipped the order manually, then you can mark the order as shipped from the vertical ellipsis icon. Manifested Manifested means that the shipment is in the origin warehouse and is in the process of being dispatched. Dispatched This status means that the shipment is dispatched to the destination warehouse from the origin warehouse. In Transit In transit means the package has left the sender's locale but has not yet been delivered to the intended recipient's address. It is en route, in between the point of origination and the point of destination on whatever conveyance is being used to transport the product-railroad, plane, truck or boat. Delivered This status means that the shipment is delivered to the receiver. RTO In case a shipping package could not be delivered at your doorstep for a certain reason like door found locked or location not found etc, the item must return to the warehouse. Return This status is shown if the return request is sent to the shipping provider from either the shipper or receiver end. You can print shipping label after the order is shipped. You can print Invoice of the order as some logistics providers require that to be sent along with shipment. StoreHippo automatically updates the status of the shipments done through supported logistics providers. You can also configure Mail Notification for Shipping Status Change when the order's shipment status changes.